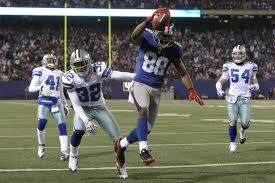 NFL season is right around the corner-how is Giant Hakeem Nicks? Fall means the start of another NFL season and my happy place is watching the New York Giants every Sunday or Thursday or Monday. It’s no secret I’m a huge fan. Giants training camp at the University at Albany begins on July 26th and I’m checking my mailbox every day for my season tickets. Can’t wait for that opening day game September 5th when they take on the Cowboys. I also started thinking about the rehab of a key Giant who may miss opening day: Wide Receiver Hakeem Nicks. If you recall, on May 24th, Nicks broke the 5th Metatatarsal in his right foot. At that time it was announced he would be sidelined for twelve weeks. This week marks eight weeks since the injury happened and by now his right foot should be out of its cast and physical rehab underway to strengthen his legs, ankles and feet. Six weeks immobilized in a cast will have weakened his muscles more than you think. But he’s probably been using the stationary cycle, and getting massage and hydro therapy. Hakeem should be doing simple stretches of his foot and ankle to start to recondition those tight muscles, ligaments and tendons. He’ll start with simple exercises while laying on his back (see pic) and then flexibility and range of motion exercises while standing. He’ll also now be slowly increasing stress on the metatarsal, as a bone actually heals and grows in response to the stress placed upon it. As anyone who’s ever broken their foot knows, pain may last in the bone quite awhile, even after it’s healed. Nicks will undoubtedly be icing and elevating his foot every day after he does his therapy to control pain and any residual swelling. When appropriate, Nicks will return to walking, then running, then sprinting. He’ll also perform plyometric exercises as soon as possible to restore speed, quickness and power. I’m hoping for my happy place: Hakeem Nicks in the lineup opening day. He’s key to the Giants offense, as he’s Eli’s best deep target, can jump like nobody’s business, and attracts extra attention and double teaming from defenses, which leaves teammates like Cruz open to make the play.